The DEMA tradeshow is in full swing right now with many new product launches. 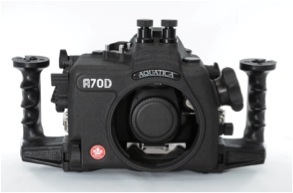 As underwater photographers, our attention was drawn to Aquatica's new housing for the Canon 70D. The 70D is the first camera to feature a Dual Pixel CMOS AF Sensor. What's so great about it? To date, digital SLRs have used advanced phase detection autofocus through the viewfinder and slower contrast detection AF in live view. The Dual Pixel CMOS AF sensor allows use of phase detection AF in both viewfinder and live view, providing fast and accurate autofocus for video and live view shooting. The 70D presents the new standard for video autofocus on DSLRs. Montreal, QC. 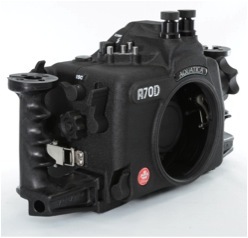 - Aquatica, the only established manufacturer of aluminum DSLR housings in North America, announced today the release of the A70D housing for the Canon 70D. With over 30 years of experience, the A70D housing has been carefully designed and manufactures with the finest and latest technological innovations. Aquatica’s deep engineering mastery has yielded once more a finely crafted underwater housing. The housing is priced competitively at a price point of USD $2,699.00 and will be available January 2014. The Canon 70D comes along with a 20.2 MP APS-C sensor and offers lots of innovation in the field of autofocus with their Dual Pixel CMOS technology allowing delivery of smooth and precise autofocus in full HD mode that were thought to be impossible until now. The camera comes with fast acquisition in the LIVE VIEW mode brushing off the most challenging of situations easily. This new Auto Focus technology paired with the 19 points AF system enables the camera to shoot up to 7 frames at full resolution with tack sharps results. Furthermore, the wide range of ISO setting from 100-12,800 (H: 25,600) and Canon famous dynamic range lets the photographer take advantage of the light, no matter how dim it is. 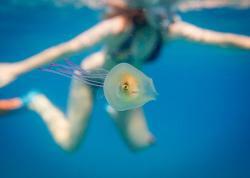 The AF system is highly customizable allowing you to adapt to your subject, this, obliviously, is a much desirable asset in underwater photography. 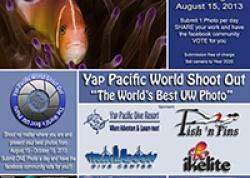 The viewfinder of the camera has 98% coverage of the image, another desirable trait for the underwater photographer. Besides excellent still images, the Canon 70D also lets you shoot full HD movie with a 1920 x 1080p resolution and to push the creative boundary even further, frame rates can be adjusted to 30, 25 & 24fps in HD and in the 720p mode up to 50 and 60fps. Ergonomic comfort does matter and Aquatica has, yet again, lifted the bar higher in this sense with the release of their A70D housing. Our innovative design team has conceived a precise, under your fingertips, housing that does away with confusing and cluttered controls area. The Aquatica A70D is spaciously located for easy access, even with the thickest of cold water gloves and its vital functions have been extended to “hands on the grip” positions allowing optimization of underwater buoyancy. 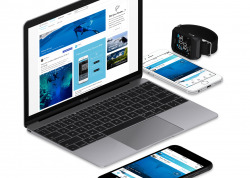 Aquatica has developed a new atmospheric pressure sensitive circuitry that will allow the user to confirm water tight integrity before the dive. This new system will give the user additional peace of mind, knowing their expensive camera equipment will stay dry. 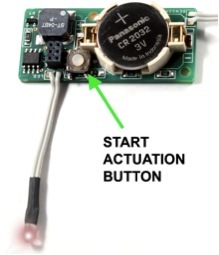 Once your camera is installed, simply push the start actuating button (integrated on the circuit board). The LED light will turn green for two seconds, this will confirm actuation. Once a solid vacuum is achieved, the LED will blink green again for two seconds. During the dive the LED will flash green every few seconds, indicating system integrity. If the vacuum starts to decrease, the LED will start to flash orange, and if water is detected, the audible alarm will go off and the LED will also flash red. The advanced Aquatica circuit has a temperature compensation included, so any change in ambient temperature or changes in the internal temperature will not cause an incorrect reading. The onboard start actuating button is for the vacuum only; your alarm is always on. This new Aquatica vacuum/alarm system is the most thought-out on the market today. The underwater photographer can now be assured with a single look, that their housing has water tight integrity before, during and after the dive. The Aquatica A70D housing shell is built of the finest material available; crafted to military specification and meant to last a life time. It wraps around the Canon 70D like a glove and the access to the Quick Command knob has been totally redesigned from previous housings and is now positioned at a nice comfortable angle, right next to the main command knob, and just waiting for your creative input. The AF-ON /* (star) lever is fitted with a rotating collar, this features allowing access to function without the need for obstructive levers sticking out the housing. All while retaining its ease and simplicity of operation, the all important ISO function button is now activated with a thumb activated lever, again positioned so it does not overwhelm the already busy right hand side of the housing. 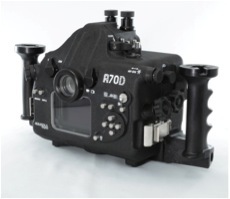 The Aquatica A70D also takes full advantage of the Canon 70D high level of video performance, the access to the video feature of the camera has been optimized on the housing allowing a smooth underwater adventure. Aquatica has pioneered oversized controls for decades, quite conscious that not everyone dives “warm tropical” conditions. Aquatica housings have been used under the ice of the Arctic Polar cap and they have withstood months of absolute brutal winter conditions in Antarctica, having plunged into the most extreme cave environment, been trekked all over the world to the remotest of area and yet, they remain tailored to your essential requirement. Moreover, the housing features quick and easy camera insertion into the housing, water proof integrity being secured with a reliable time proven closure system equipped with safety locks. A Reliable port lock mechanism also safely locks in the port to the housing. The comfortable housing grips are a sturdy platform for mounting the largest strobe and lighting without flexing or when requiring additional support. Viewing is done with a state of the art Galileo view finder; Aquatica introduced its Aqua View series of finder a few years ago, and has built a solid reputation for crystal clear andprecision viewing. The Aqua View 180o finder is a streamlined design that is compact and non obstructive to the rear camera LCD window, the dioptric adjustment is internal, thus eliminating both unnecessary external bulk and the risk of being thrown out of adjustment unintentionally. The Aqua View 45o finder offers one, if not the most, compact profile of any 45 degree finders, it easily rotates left or right allowing vertical shooting. These accessories finders provide the utmost accuracy, brightness and best viewing comfort that you can experience underwater. No special tools are required to mount these accessories to the housing allowing new users to mount one safely and in very little time. Understandably, the ports system of any housing system is the key to optical performance, the Aquatica system is composed of four hemispherical dome ports, the 4” mini dome, the 6” dome, the 8” dome and the 9.25” Megadome. Three flat ports are available and nine ports extensions ring ensure that you can take full advantage from one of the largest range of supported lens for underwater photography. The Aquatica A70D and it other siblings, have the largest selection of strobe connections. The optical fiber connections provided are compatible with standard off the shelf cord and do not require proprietary adapters or specially made cords. The unique strobe connectors system, designed by Aquatica, allows for modifying, adapting, replacing or alternating connectors simply in a matter of minutes without requiring any special tools. This design is made for easy field maintenance and the result is a long history of working with professionals in remote locations and paying attention to their needs. 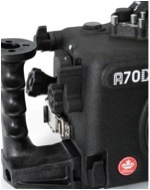 Aside from addressing all existing optical strobe requirements, the A70D can also be equipped with classic Nikonos type connectors or with Ikelite original bulkhead connections. Extra access bulkhead on the housing provide space for accessories such as our own Aquatica Remote Trigger grip and Amphibico (or other brand of) video monitor. Founded in 1982, Aquatica designs and manufactures directly from Canada a fine line of quality aluminum housings for underwater photography.